As a child in wartime England, Janet White decided that she wanted to live somewhere wild and supremely beautiful, to inhabit and work the landscape. She imagined searching the whole world for a place, high and remote as a sheep stell, quiet as a monastery, challenging and virginal, untouched and unknown. Turning her back on convention, Janet's desire to carve out her own pastoral Eden has taken her from the Cheviot Hills to Sussex and Somerset, via the savage beauty of rural New Zealand. 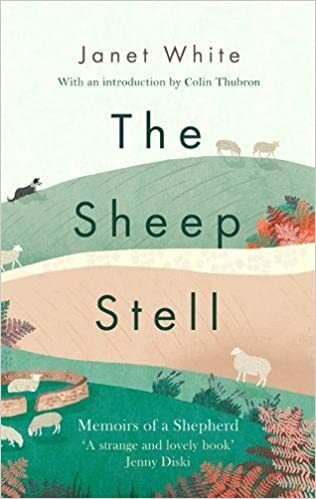 The Sheep Stell tells the tale of a woman before her time; a woman with incredible courage and determination, truly devoted to the land and its creatures. Evocative, unaffected and profound, it is a lost classic. The Sheep Stell is the story of a remarkable woman’s life. Janet White is someone who, in the era concerned, had little regard for norms I think. It opens with a chapter wonderfully evocative of an English countryside which has disappeared. It is the mid 1940s in the Cotswolds. Janet’s ideal is to work on a farm with animals. In that she proves very successful over her whole life and journeys far in doing so. She also seeks isolation and wilderness for a preference – she succeeds in that for much of her life too. After learning her craft in fairly remote parts of the UK, Janet decides it’s time for a change and takes an emigrant passage to New Zealand. Bearing in mind she is on her own and this is still the 1950s I find her behaviour unusual to say the least. Throughout the Sheep Stell she comes over as someone who simply cannot see that something might not be possible. After doing the relatively mundane job she signed up to she finds an isolated island and persuades the owner that she can run the island and have her own livestock on there and manage on her own! I found charm and simplicity to the writing and, for much of the book, a real feel of a time now long passed. She writes in a very open way about her life and feelings even if animals and the landscapes dominate the story. She is an acute observer of all that interests her with remarkably vivid memories of long ago events. In a sense this is a good book for “romantics” – she is someone who seems to gather male attention around her like moths to a light. However more broadly this does have a rather romantic feel to it coming from a slightly different era in relatively recent time. Early on I was left with the feeling that this is a remarkable story told by a very good writer. It is not earth shattering or momentous but it holds great qualities. That feeling never really went away. I do probably have a slight preference for the first half of the Sheep Stell. It is wilder and more interesting to me. The second half was far more “domesticated” in a number of senses and, while good, was a little less appealing. 4.5/5 I think and happily recommended to anyone it appeals to.